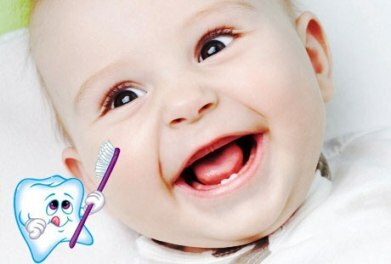 Hi, this time I want to share about simple tips to keep your baby’s teeth. Dental care should be treated from the first teething. If the baby teeth have been damaged, is more difficult to repair and restore it when adults. Therefore, take care of your baby’s dental health from today. When your baby grows teeth, clean the teeth at least once a day with a soft cloth or baby toothbrush. The best time to clean your baby’s teeth is before bed. If visible spots or stains on baby teeth, consult a doctor before it’s too late and your baby teeth have been damaged. When the child was 2 years old, start brushing your child’s teeth using a pea-sized toothpaste that contains fluoride. Children under the age of five are not able to brush her teeth until the age of 7 or 8 years old, so you need to help to make sure your child’s teeth stay healthy. Choose foods that do not have a lot of sugar in it. Give your child fruits and vegetables, avoid giving candy and cookies. Also not to be forgotten, do not let the kids sleep at night or during the day with the sucking milk from a bottle as this can damage the teeth. If the child cannot sleep without sucking the bottle, fill the bottle with just water alone. Consult your baby’s teeth to the dentist from the age of one year to detect early tooth decay. In addition, your child becomes familiar with the dental chair at an early age.